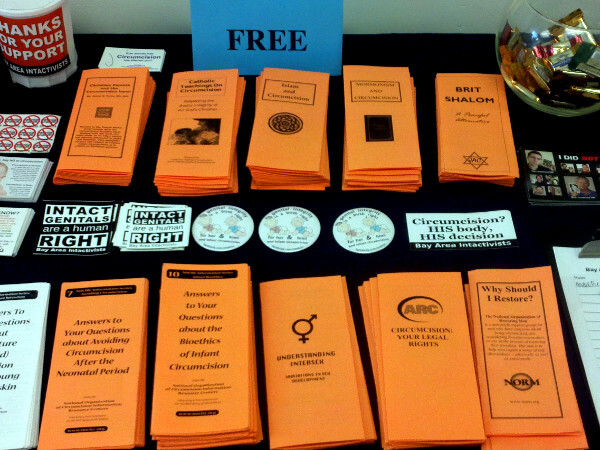 Three members of the human rights group Bay Area Intactivists spent last Saturday afternoon dispelling myths about infant circumcision as part of the Bay Area Birth Justice Fair. The event, which took place at the West Oakland Family Resource Center, focused on empowering birth through education. One of the intactivists, Jonathon Conte, gave a talk during the fair about the surgical risks, sexual damage, and lack of necessity in regard to infant circumcision. Conte also included a brief history of male and female genital cutting in the United States, including its original intent as a form of sexual repression to discourage masturbation. Bay Area Intactivists will also have a booth at the upcoming San Francisco Birth & Baby Fair which will take place on June 22 in San Mateo.